Carry a reminder of your special spot plus photos of the ones with this personalized piece. Funny how a few streets and landmarks can remind you of a favorite spot on the map. Not to mention the smiling faces that make that place "home." 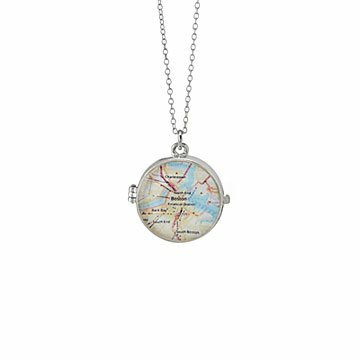 This personalized piece celebrates both by showing your hometown, old stomping ground, or summer getaway through map or chart swatches. They're set in the cover of a classic snap-closure locket, letting you carry a reminder of those priceless people and places to keep your personal GPS in sync. Suspended from a sterling silver chain, it makes a thoughtful keepsake for yourself or anyone who likes traditional jewelry design with a distinctive twist. Sterling silver plate over pewter. Handmade by Charlotte Guptill in Portland, Maine. Gently wipe with silver polishing cloth. My girlfriend never got to really use this product. The clasp broke as soon as we tried opening the locket. It is poor design. The back etching is overshadowed by the maker's enormous branding. I regret buying this. A simple map keychain would have been better. I would return it, but I can't since it is a custom made item. I'm incredibly disappointed.